West Ham manager Sam Allardyce says the Football Association was "wrong" to charge Leicester City boss Nigel Pearson over his argument with a fan. 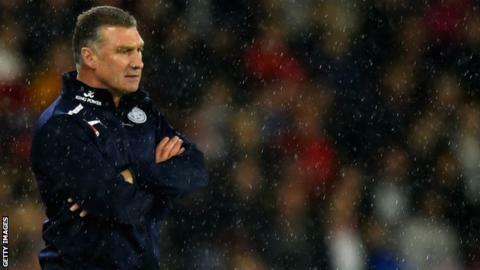 Pearson is accused of using "abusive and/or insulting words" towards a Foxes supporter in the defeat by Liverpool. Allardyce said: "He should get a warning about his future conduct, because he hasn't stepped out of line." West Ham face Leicester in the Premier League at Upton Park on Saturday. Pearson has accepted the charge and requested a personal hearing, but refused to apologise to the spectator. Allardyce, who has been the target of abuse from West Ham fans, said: "It depends on what position you are in and if somebody has baited you as much as that fella did. Then if you get a reaction, you get a reaction. "We are all human beings, aren't we? When you lose your rag, what do you do? Do you stay calm? No. So we cannot be angels all the time in this badly politically correct world we have. "This politically correct world drives you up the wall. We will be shutting the door too hard soon; it will make too big a noise for somebody and that will upset." Allardyce said Pearson was let down by Leicester security staff, who should have made the fan leave the ground. He added: "They should have gone over, nipped him by the collar and pushed him out and said, 'Don't bother coming back here'. "It is what Manchester United have been doing for years to stop anything like that happening."